Overall, about half of adult Facebook users, 47%, “ever” get news there. That amounts to 30% of the population. In particular, younger adults, who as a group are less engaged than their elders are with news on other platforms, are as engaged, if not more so, with news on Facebook. Young people (18- to 29– year-olds) account for about a third, 34%, of Facebook news consumers. That far outpaces the 20% that they account for among Facebook users who do not get news on the site. What’s more, these 18- to 29-year-olds get news on Facebook across topics at roughly the same levels as older age groups, turn there as often for breaking news and deem the site as important a source of news. All in all, then, it may be the very incidental nature of the site that ultimately exposes more people to news there. Indeed, the more time one spends on the site, the more likely they are to get news there. Two-thirds (67%) of those who use Facebook for at least an hour a day get news there compared with only 41% of those who spend less than an hour a day on the site. Facebook news consumers still access other platforms for news to roughly the same degree as the population overall. Four-in-ten (42%) Facebook news consumers often watch local television news, as do 46% of all U.S. adults; 23% often watch cable news (compared with 24% of all U.S. adults). 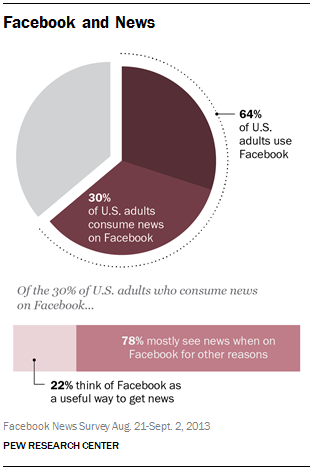 But, just 21% of Facebook news consumers often read print newspapers, compared with 27% of the population overall. News consumption on Facebook does not replace other activities. Those who consume news on Facebook are more active on the site than other users by nearly every measure. Fully 77% are driven to the platform to see what friends are up to (compared with 60% of other Facebook users), 49% go to chat with friends and family (versus 29%) and 26% go to post personal updates (versus 9%). In addition, almost two-thirds (65%) of those who get news on Facebook visit the site several times a day, compared with about three-in-ten (29%) other Facebook users. Roughly half, 49%, of Facebook news consumers report regularly getting news on six or more different topics. The most popular topic is entertainment news, which 73% of Facebook news consumers get regularly on the site. Close behind is news about events in one’s own community (65%). National politics and government rank fourth, reaching 55% of these consumers regularly, just behind sports, which reaches 57% regularly. Still, Facebook has yet to become a platform for learning about news events as they happen. Just 28% of Facebook news consumers have ever turned there for breaking news. Liking or commenting on news stories occurs almost as frequently as clicking on links, though back and forth discussions are less common. About two-thirds (64%) of Facebook news consumers at least sometimes click on news links (16% do so often). Nearly as many, 60%, at least sometimes “like” or comment on stories (19% do so often). Just under half, 43% post or share links themselves at least sometimes (10% do so often) and about a third, 32%, discuss issues in the news with other people on Facebook (6% do so often). News outlets rank low in the reasons Facebook news consumers click on news links. The biggest single reason people cite for clicking on links to news stories is interest in the topic; 70% name this as a major reason to click on news links. About half say finding the story entertaining (51%) or surprising (50%) is a major reason; 37% say a friend’s recommendation is a major reason. On the other hand, that the link came from a news organization they preferred is cited by just 20% as a major reason for clicking – outpacing only that the story had a lot of “likes” (13%). Facebook news consumers who “like” or follow news organizations or journalists show high levels of news engagement on the site. About a third, 34%, of Facebook news consumers have news organizations or individual journalists in their feeds. Those who do are more likely to see the site as an important way to get news than those who do not have news organizations or journalists in their feed (54% versus 38%). They are also nearly three times as likely to often click on news links (27% versus 10%)and discuss issues in the news with others on Facebook (11% versus 4%). They are twice as likely to often post or share stories (16% versus 7%) and “like” or comment on stories (29% versus 15%). As with U.S. adults overall, only a minority of Facebook news consumers say they prefer news that shares their point of view. Less than a third, 31%, of Facebook news consumers generally prefer news that shares their own point of view, just slightly higher than the 27% of U.S. adults who say the same. And, when asked about things that bother them on Facebook, twice as many Facebook news consumers are bothered when people post political statements (whether related to the news or not) than when people post opinions about something in the news (32% versus 14%). And, 58% have been surprised by a friend’s or family member’s opinion about an event in the news on the site. Among U.S. adults, the desktop/laptop computer is still the primary way most adults access Facebook. Fully 59% of all adult Facebook users and 53% of Facebook news consumers mostly access the site through a desktop or laptop computer rather than a mobile device such as a smartphone or tablet. And while the primarily mobile users tend to check in more frequently, desktop users clock more total time: 37% of mainly desktop/laptop Facebook news consumers spend an hour or more a day on the site, compared with 28% of mainly mobile Facebook news consumers. This report is based on a Pew Research Center survey conducted Aug. 21-Sept. 2, 2013, among a nationally representative sample of adults 18 years of age or older. The sample comprised 5,173 respondents, 3,268 of whom are Facebook users, of which 1,429 are Facebook news consumers. The survey questionnaire was written by the Pew Research Center and administered by GfK using KnowledgePanel, its nationally representative online research panel. For questions asked of the full sample of 5,173, the margin of sampling error is plus or minus 1.7 percentage points at the 95% confidence level. For Facebook users, the margin of error is plus or minus 2.2 percentage points; for Facebook news consumers, it is 3.3 percentage points. For more details on the survey methodology, see methodology section.